During road and freeway work upgrades, existing drainage grates that are normally out of traffic flow were placed into traffic flow. 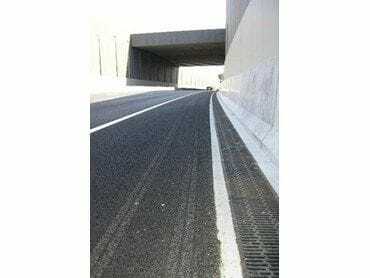 While the grates had previously been tested in accordance with Australian Standard 3996, the client was concerned that the system holding down these grates would fail due to repeated vehicle loading potentially resulting in grates being flung into traffic and drainage pits being exposed. To avoid these two potential safety risks, the client needed to develop and test a lock-down system for the grates to ensure they could withstand the increased vehicle cyclic loading. The client engaged HRL to review the installation procedure, and assist the manufacturer to design a new pre-loaded locking system for the grates. Not satisfied with the theoretical calculations alone, this Australian manufacturer wanted to prove the design by testing the system to ensure its safety. Designing and implementing a comprehensive testing process, HRL installed strain gauges to the grate, frame, and hold-down system to measure forces and determine stresses during a dynamic loading event from a B-Double semi-trailer (the worst-case loading scenario). Test results were documented in a thorough project report. The testing showed that stresses and loading in the grate lock-down system were within allowable limits to ensure a safe working life. The client was satisfied that HRL had proven the safety of their supplied design, mitigating all potential safety risks to road users.